Adult stem cells could be used to create biological pacemakers for patients with heart failure, a leading cardiologist has told the BBC's Discovery programme. Ira Cohen, of the State University of New York at Stony Brook, US, says the pacemaker manufacturer Guidant is funding the project to see whether immature cells from the bone marrow can be genetically engineered to create pulsations that drive the human heart. Some heart patients suffer from arrhythmia, a condition where the natural pacemaker for the heart, a specialised cluster of cells in the sinus node of the heart, fail to transmit their rhythm to the heart muscle. Patients with arrhythmia can use electronic implants which deliver regular electrical impulses to the tissue instead. Although effective, the need for surgery to insert the devices, for wires to carry the currents and for batteries with a finite lifetime, mean that a fully biological alternative would be better. Professor Cohen explains that cardiologists like himself picture hearts more in terms of electrical circuits than as fluid pumps. 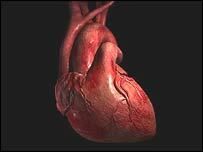 A heartbeat is initiated by an electrical pulse generated by the pacemaker cells. The pulse itself comes from a cascade of electrical charge released from individual cells by specialised protein channels. As the current hits neighbouring cells, they too release charge, and a wave of electrical activity perfuses the heart tissue, triggering muscle contraction as it passes by. For the new stem cell therapy, Professor Cohen and his colleagues have taken the gene encoding the pacemaker channel protein, called HCN2, and inserted copies of it into muscle-precursor stem cells extracted from bone marrow. As well as showing that the engineered cells show the same electrical activity as natural pacemaker cells, the researchers injected them into a dog's heart. "We've been able to generate over a brief period of time a stable biological rhythm in the dog's heart which we can map to the point of injection," Professor Cohen told Discovery. Furthermore, the implanted cells integrate themselves into the heart's normal electrical circuitry, and respond to the natural hormonal messengers that accelerate and slow the heartbeat. Researchers have previously experimented with gene therapy for arrhythmia, using viruses to carry the channel gene directly into heart cells. The problem there is that the more benign version of this treatment, using cold-type adenoviruses, has only a short-lived effect, whereas the stronger form using retroviruses carry the unacceptable risk of causing cancers. Given that, the new stem cell therapy looks promising, and Professor Cohen hopes clinical trials will start in three to five years. "In our dreams, a patient could come to the hospital, we could take a sample of his bone marrow, put the gene into his own cells, and deliver this biological pacemaker to the patient's own heart." Stem cells as heart "pacemakers"